Our series, Featured Weddings brings you wonderful moments from weddings held at the finest venues across different cities. 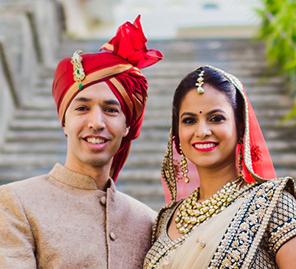 Here, bride Monica tells us all about how she met her husband Puneet and their wedding celebrations at the stunning and historic Hotel Fateh Garh – a Heritage Renaissance Resort - in Udaipur. 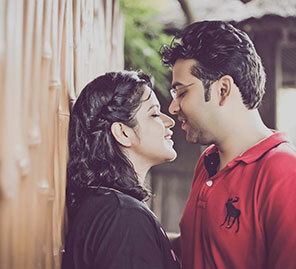 “Puneet and I were both busy professionals and our parents are good friends. So one day we met up in a restaurant and were chatting formally for a while. I decided to order a cup of coffee, and Puneet suddenly asked me if we could have a bottle of red wine instead. ‘Why don’t we enjoy ourselves and leave the world aside?’ he said, and that really broke the ice. After that, we kept messaging each other and meeting up. We dated for about a year and a half, and then our parents fixed our wedding without our formal consent as they could see how happy we were with each other and had noticed our chemistry…” shares Monica. "Our sangeet was like a Bollywood celebrity night and took place after our traditional mehndi event where I wore a bright green saree paired with a vibrant yellow blouse and gold jewellery. There were colourful 'lehariya' drapes and marigold blooms that formed the decor of the mehndi. The theme for the sangeet all about elegance, and we had peach accents in the chairs to the tables laid out in the sprawling terrace of the hotel, next to the pool. Rajasthan Roots (a collective fusion band comprising folk musicians from the desert state) rocked the evening with their tracks. Our families performed choreographed dances, and everyone partied non-stop till 3am in the morning. It was truly a memorable night!" 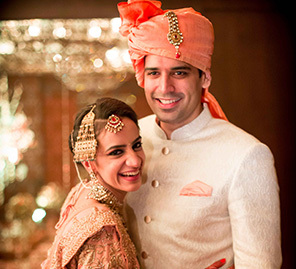 Monica's wedding lehenga was designed by Manish Tripathi under his label Naveli. This rich yellow and orange ensemble was paired with a red 'bandini' dupatta that glinted with a shimmering gold border. The deep gold jewellery complemented the lush richness of the fabrics, and Puneet's light brown sherwani with all-over gold threadwork, standout motifs and light brown 'safa' complemented Monica's look perfectly. The regal 'mandap' was adorned with lattice of blooms strewn across the pillars and also forming a splendid canopy, profusion of floral arrangements in the front and carefully arranged spotlights to bring out the highlights of the setup. 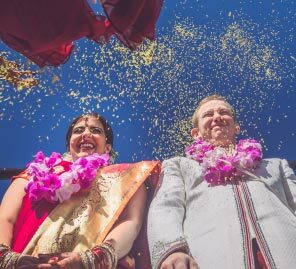 Puneet made his grand entry in a traditional horse-drawn carriage that was festooned with bright orange marigold blooms. Even his 'baraat' wore orange 'safas' and looked nicely coordinated.